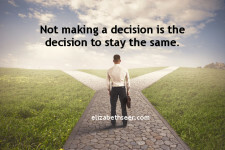 Not making a decision, refusing to make a choice, leaves you on your current path. Are you happy with that path? If yes, then stay the course. Has your position become stagnant, needing an infusion of energy? Then it’s probably time to make a choice for something different.